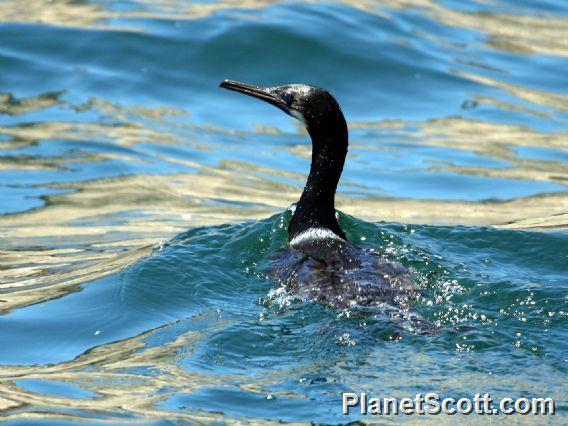 A large cormorant of the Pacific Coast, the Brandt's Cormorant is found only in marine environments. The Brandt's Cormorant is the least vocal of the North American cormorants at the nest. It makes sounds that are audible only from a few feet away. In the main part of its range, from California to Washington, the Brandt's Cormorant is tied to the rich food sources associated with upwellings of the California Current. In the nonbreeding season, when the effects of this current diminish, populations redistribute along the coast, occurring where food is locally available. Bibliographic Citation: "Brandt's Cormorant (Phalacrocorax penicillatus)." The Cornell Lab of Ornithology All About Birds. Citation Link Accessed 27 Jan 2014.